From spending time outdoors in your neighborhood to venturing out on long road trips, enjoy life to the fullest with the Golden Technologies Buzzaround XL 4-Wheel Scooter. Sleek and compact, it's a fine example of what the latest portable Golden Tech scooters have to offer. Taking it on the road with you is easier than you think; the wireless disassembly process takes mere minutes, so you can load it in your vehicle with considerable ease and be on your way. The steps are simple: remove the seat by pulling it up and off; next, remove the wireless battery and fold down the tiller; lastly, separate the frame from the transaxle and you're done! Assembling it is just as hassle free. 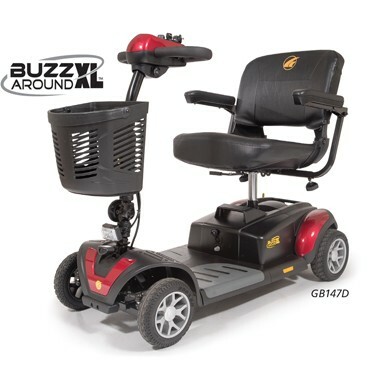 The Buzzaround XL 4-Wheel Scooter has been designed to offer more leg room and loads of other convenient features. The easy-to-clean deck offers ample foot and leg space so you can get on and off effortlessly. The deck is non-slip, too, for added safety. The extra leg room is a must for when you'll be traveling on your scooter for extended periods of time. Trying to shop cramped aisles of stores or navigating small spaces in an oversized scooter can pose a problem. The sleek design along with its tight turning radius lets you go just about anywhere. Steering the scooter is a dream thanks to the wraparound Delta tiller with a non-slip cover. The responsive handling and the throttle paddle allow you to drive with ease. Looking for a power scooter that'll allow you to enjoy time away from home for hours at a time? The Buzzaround XL comes standard with a 12 AMP hour battery to provide you with an all-day range. You'll be able to get up to 10 miles of usage on a single charge. Speaking of charging, you have two options: using the charging port located on the tiller or removing the battery and charging it indoors or anywhere there's a standard electrical outlet available. This Golden Technologies scooter is an affordable, convenient and comfortable way to stay mobile so you can live your life to the fullest. Note: If you require reduced speed option please see our scooter speed option box. Standard option 4 mph max. Reduced option 2 mph max. Easy, wireless disassembly — take apart and put together in seconds!